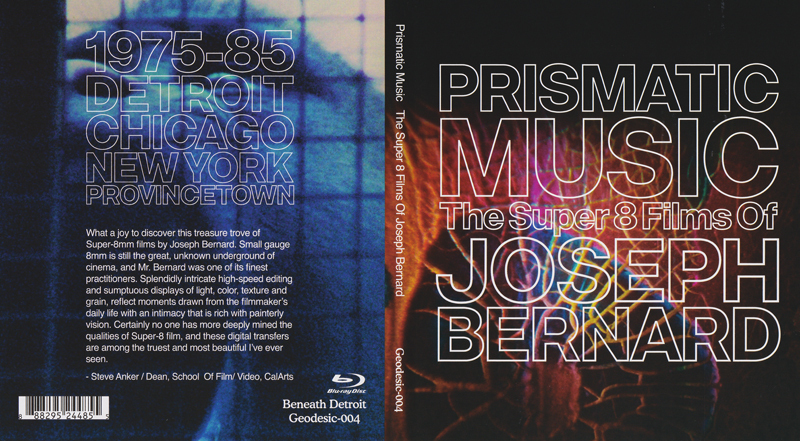 After close to three years of collective efforts, I’m proud to announce the impending completion and release of the remarkable, Blu-ray collection; PRISMATIC MUSIC: The Super 8 Films of Joseph Bernard. This 40-film package, with a total running time of 5 hrs. 47 mins., includes a 24-page booklet with essays, film notes, historic documentation and images in color. The set itself is part of a series called, Beneath Detroit, a project by Jeffery Plansker, celebrating under-recognized area artists. These films date back from the mid 1970’s to mid 80’s and all of them are purely visual and intentionally silent. There’ve been occasional screenings of selected titles, most recently at the 2014 52nd Ann Arbor Film Festival. Over 100 works were originally produced and although prints were made in both S-8 & 16mm, none were either in distribution or had been sold. Owning this collection will soon be possible. After the April 15th Premiere Screening & Release Event at the College for Creative Studies, in Detroit, the specifics for purchase will be available on this site. About the set - - this particular digital 2K version will make the viewing of these films much more accessible in that the Blu-ray Disc (1920x1080p), dual-layer format is “Region/Code-Free”; playable throughout the world. It breathes new life into these small gauge, highly hand-crafted entities. The enclosed booklet’s essays are written by L.A. and NYC filmmakers, a director, a cinematographer and an architect. They provide valuable insight and access to the work. The menu treatment and overall packaging design has been fastidiously fine-tuned. Paramount to all of this, of course, is preservation. When film sits on a shelf in unstable conditions, the fragile combination of plastic, chemical emulsion and adhesive splices, (along with added elements of inks, bleach & tape) - - all rolled somewhat tightly against itself on spools - - risks deterioration. Extremes in temperature and humidity rapidly affect film’s properties. Two offers came to the rescue. A few years ago Jeff Plansker proposed putting a group of my films onto a DVD set, along with a booklet of informational notes about them. Working with limitations in mind, the choosing of which titles would be saved was difficult. Each one was looked at numerous times on a hand-cranked viewer (my projector had been stolen), selections were made, every splice was tested, leaders & trailers replaced, relabeled, then all were cleaned and rejoined onto nineteen 400’ reels & cases. That original footage flew with me to Los Angeles where, at the Cinelicious (Hollywood) lab, all was digitally scanned, color graded shot-by-shot, then electronically filed. During the week overseeing this process, the lab’s owner called in Mark Toscano, the Film Preservationist/ archivist/ curator for the Academy Film Archive (Academy of Motion Picture Arts and Sciences). Mark looked at the films and made an offer to allow the totality of my work be perpetually preserved in the climate controlled vaults at the Academy. My original film & prints, while now in ideal safekeeping, are also available for scholarly study. With the release of PRISMATIC MUSIC, my old & fragile footage can now be viewed easily, repeatedly and in high definition, well into the future. The next plan is to explore venues to exhibit and distribute the films widely.